Rawlins County Health Center provides access to at specialty health care services without leaving your community. Below is a list of our Board of Trustees and meeting minutes. A native of Rawlins County, Harlan returned to the family farm after completing his degree in Animal Science from Kansas State University. Together with his wife Ruth, they have a red Angus cattle and grain operation near Ludell. They have three married children, all graduates of KSU, who reside in Golden, Colorado, and Manhattan, Kansas and one wonderful granddaughter, Hadley, five months of age. He enjoys serving Redeemer Lutheran Church in varying capacities, working on home improvement projects, and woodworking. Harlan feels committed to keeping RCHC a thriving health care center for our community and surrounding area. By using a common sense approach and keeping our eyes open for new opportunities, we can add to our strengths and keep RCHC a place where residents will turn to in their time of medical needs. Matt was elected to the Board in 2010. Matt is a 4th generation Rawlins County resident. He graduated from Atwood High School in 1998 and then Kansas State University in 2003 with a degree in Agricultural Economics. He returned to and has resided in Atwood/Rawlins County beginning in 2004. Matt is a founder and owner of SureFire Ag Systems, Inc. Matt believes that having quality local health care, which means a strong Hospital, serves as the foundation of growing our community. Matt and his wife Donelle (Donnie) live in Atwood. Mike and his wife, Sandy, have been residents of Atwood & Rawlins County for five years. Prior to their relocation, they lived in the Des Moines, Iowa area, where Mike had retired from a 33 ½ year career in the Iowa Army National Guard and was an employee of the State of Iowa. In addition to becoming a member of the Board of Trustees of RCHC, He is a board member of the Atwood Township, the president of the Board of Directors of the Atwood Country Club, the president of the Atwood Rotary Club and a member of the board of the Knights of Columbus Council. While residing in Iowa, Mike had a very limited time to devote to community service, so when they retired and moved to Atwood, Sandy & Mike both decided to become more involved in their community and support it as much as they can. Rosalie grew up in St. Francis, attended Phillips University and has a degree from Colby Community College. The family moved to Atwood when her husband, Keith, began his teaching career at Atwood High School. Rosalie worked as a medical assistant for several doctors. She is a newspaper editor, active in the Christian Church and Rotary Club. She has two married sons and five grown grandchildren. Mike attended Atwood High School, and after graduating from Kansas State University with a BS in Economics, Mike moved back with his wife, Rosie to help manage Williams Brothers Supermarket with his father, Luke. Mike and Rosie have three married children and eight grandchildren. Mike and Rosie have both recently retired from their respective jobs and enjoy visiting their children and grandchildren. Mike is looking forward to serving the residents of Rawlins County on the RCHC Board. Cedric Green graduated from Rawlins County High School in 2006 and then Kansas State University in 2011 with a Bachelors degree in Architectural Engineering. He then spent the first 3-1/2 years of his professional career in the Denver metro area designing and overseeing the construction of HVAC, plumbing, and medical gas systems in hospitals and medical office buildings. Cedric is a licensed Professional Engineer in the State of Kansas. After the birth of their first daughter Kinley, Cedric and Emily returned to Atwood to be closer to family and friends, and Cedric accepted a job at SureFire Ag Systems, Inc. They both strive to give back to the community that raised them and work to continue to grow and attract young professionals back to Atwood. Roger Philpott and his wife, Maralyn moved to Atwood in 1971. Roger is currently working on oil and gas investments and consulting. He has owned and operated several successful businesses in agriculture, food, and retail. Roger has served on the Rawlins County Hospital Foundation board since 2014 and would like to see the Rawlins County Health Center remain operating as a viable, up-to-date and financially sound entity. Roger will remain on the Rawlins County Hospital Foundation Board as a Board of Trustee representative. A lifetime resident of Rawlins County, Phil feels that giving back to the community is important. Serving on the RCHC Board since 1989 has allowed him to do that. Being on the hospital board has turned out to be a very rewarding experience. Sandy and Phil have served on many boards and participated in many community activities. Raising and educating their three children, David, Mary, and Mark, in Rawlins County has shown Phil the importance of a viable community with good health care, education, and opportunities for 4-H, scouting, and other activities available. We have created a community with employment opportunities that can attract young people. After farming in Rawlins and Thomas Counties for fifty years, Sandy and Phil retired and turned the farm over to David. They are now able to travel, visit children, grandchildren and great-grandchildren. Phil is an RCHC Board of Trustees representative on the Rawlins County Hospital Foundation Board. Brooklyn has been part of the Rawlins County community since she was born, and has recently returned home to stay. She began working for Vap Construction in 2014 as an intern while studying business at Colby Community College. She took a year and a half “sabbatical” when she moved to Texas in 2015. However, she missed Atwood and her Vap Construction family and returned to Atwood in April of 2017. 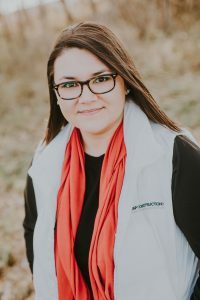 Brooklyn recently completed a certificate in Human Resources Management and is enrolled in the Rawlins County Entrepreneurial Certificate Program. She is an active supporter of the arts and music in our community. Brooklyn brings a youthful energy to the board and feels her service on the board will encourage others to invest time and effort in the community. By keeping the hospital viable, she hopes to attract other young people to return home.